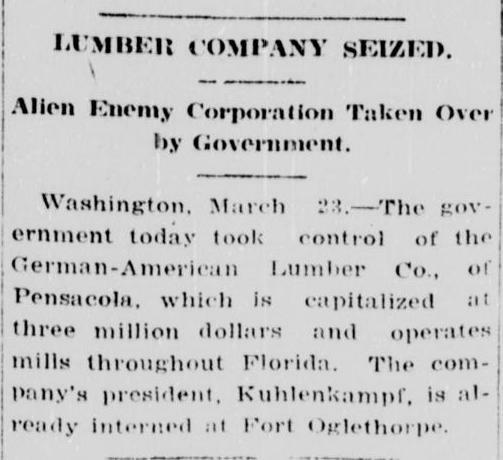 A Pensacola, FL lumber company with $3M in assets has been seized from an enemy alien, the company President, Kuhlemkampf has already been interned at Fort Oglethorpe. The Milwaukee Council of Defense Chairman, Wheeler Bloodgood, states that is practically assured he will have to place the city under military law because the city's socialist mayor has been renominated. Bloodgood says the indictment of the mayor would be required because the socialist platform declares the "people did not want the war, and that I [Bloodgood] was forced on them by the ruling classes." Source: "Lumber Company Seized," The Watchman and Southron, Sumter, South Carolina, March 27, 1918. Page 1, Column 5.